You soak crushed, malted grains in hot water to change starch into sugar, then drain away the resulting sugary liquid, which is your wort. Here's a couple of photos, of the runnings from the mash tun and the lovely, sweet wort that I was given to taste. Brewing beer from the grain is an ancient technique, probably going back into prehistory, with the first maltsters and brewers of the Fertile Crescent some ten or maybe twelve thousand years ago. Local herbs and plants were used as flavourings and preservatives instead of hops, of course, but this is the way that the wort for ale and beer has been traditionally made. You need sugars to ferment into alcohol and this is a two step process. Malting and mashing are fundamental aspects of the beer brewing process. These are the processes that have, for millennia, transformed starchy harvested grain into sweet wort that is fermented into ale and beer. It's not practical for us to make our own malt at home. We just don't have the facilities. I suppose I could steep some grain in a very large bucket, changing the water every four to six hours, thus giving the grain its necessary air rests. But there's no space in my home for a malting floor. I'm looking with interest at some of the traditional Norwegian farmhouse malting techniques that involve germinating the grain in wooden trays or boxes in the sauna building. No need for a germinating floor. Beer historians Mika Laitinen and Lars Garshol have visited, worked with and interviewed brewers who still make their own malts. If you want to know more about this and see some fabulous images of the buildings and necessary equipment then follow the links above. I've learned from Lars and Mika that you don't need a malting floor to make household quantities of malt for ale and beer brewing. However, the malt must be very carefully dried, and that's something that needs a lot of serious consideration and planning. As I explained in the previous post, a base malt is not roasted or toasted. High temperatures destroy the starch converting enzymes. A base malt is dried with care, without overheating, so that the enzymes within the partially germinated grain remain viable. They reactivate in the mash tun where they will convert all of the grain starch into fermentable malt sugars. Instead of making our own malt at home we order a sack from an online supplier. It arrives fresh, having been crushed within the previous couple of days and sent by courier. Freshly crushed malt makes good beer. Stale malt is not so good. When we lived in a city we ordered a 25kg sack of base malt from the local homebrew shop, collecting it ourselves. The malt that we buy is made in a modern germinating kilning vessel (GKV) where the grain is steeped, air rested and dried, all in the same enormous vessel. The germination process within the grains remains the same as if it had been malted using traditional methods, such as floor malting. 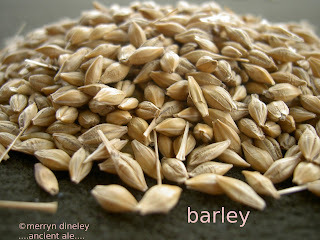 Some argue that there is a difference in flavour between floor malted grain and that made in a GKV. I don't know about that. You might be wondering, where did all these traditional malting floors go? I do know a little about that story and wrote a post about it a while ago. The good news is that traditional floor malting is making a comeback. what happens inside the grain as it germinates? This is, for me, the magic of the malt. The biochemistry and physiology of germination were not understood until the 1960s. Yet maltsters have been making good malt for thousands of years. The technology has developed. Maltsters knew exactly what they had to do in order to keep the spirit of the grain alive. Take a look at the book on Malt and Malting by Henry Stopes (1885) if you want to read about the traditional technologies that were involved prior to a biochemical understanding of the germination process. No need to buy it. It's been scanned in, with illustrations. 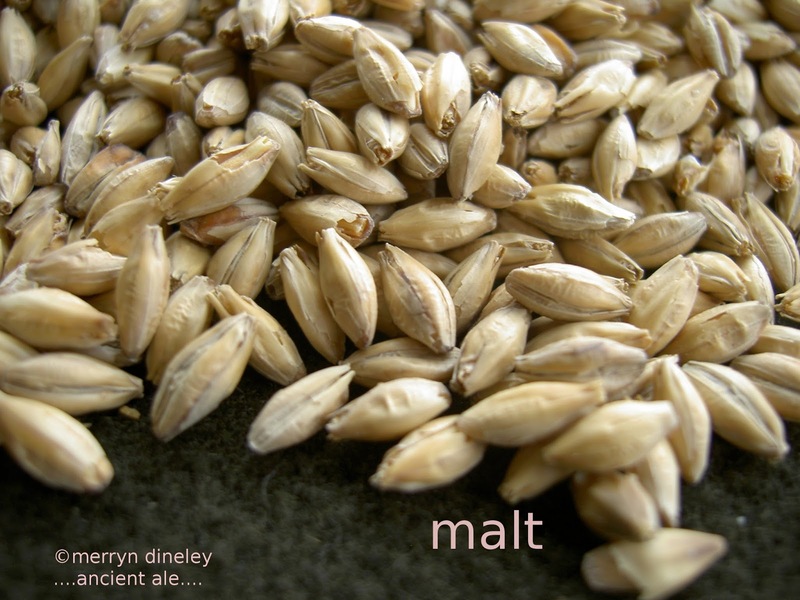 A fabulous resource for the study of traditional and historic malting technologies. Below is a section through a barley grain as it begins to germinate. It shows the structure of the grain and some of the chemical changes that occur within it that enable growth. In the steeping process, the grain absorbs water and oxygen, both are necessary for germination to begin. The embryo (scutellum) releases a growth hormone, gibberellin, that stimulates the aleurone layer to release enzymes that convert starch into sugars, the food source for the growing plant. The aleurone layer is a single layer of cells beneath the husk. There are other biochemical changes within the grain, for example, some enzymes break down the husk making it easier to crush. see Bewley and Black Seeds and physiology of germination for the original diagram. The second image, below, shows what happens when the grain is on the germination floor. Enzymes convert some of the starchy endosperm into malt sugars. The technical term for this part of the process is modification. You can see that the endosperm has been wholly modified (wm), mostly modified (mm), partially modified (pm) and unmodified (um) at this stage. When rootlets show the grain is ready for drying. If the maltster is lucky, they live in a hot, sunny climate where the malt can be dried in the sun, as described in the Hymn to Ninkasi. Otherwise, the malt is dried in a kiln with warm air, and sometimes smoke, passing through the bed of grain. Drying malt takes several days. 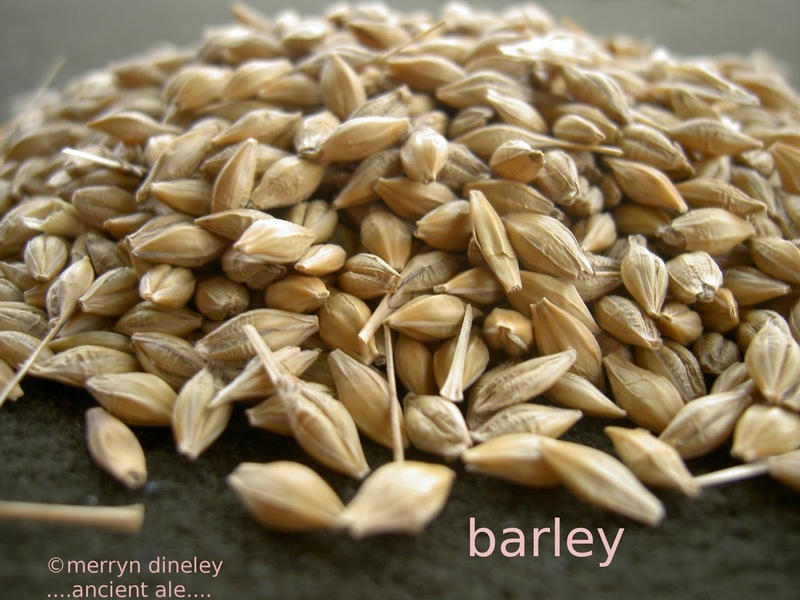 The biochemistry and physiology of grain germination is now one of the most studied aspects of barley, wheat and rye. All of these grains can be malted. I know that what I've written here is just a fairly basic explanation of grain germination. I've tried to keep it simple. If you want to know more, read Bewley and Black, or read some of the more recent papers by a wide range of scholars, many of which can be found on the internet. what happens in the mash tun? The mash tun is where the sugars are made. Many different vessels can be used as a mash tun. If the vessel is made of wood then you must use hot stones to heat the mash. If not, then you can use fire. For the brewer, 'mashing in' is not like mashing grapes or mashing potatoes. It's more like mashing tea, perhaps. 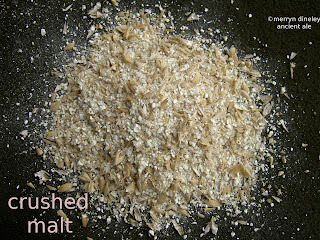 The crushed malt is left in hot water for about an hour. The enzymes need time to work. And the temperature needs to be right. Below 60 degrees Centigrade the conversion is so slow that you risk infection. 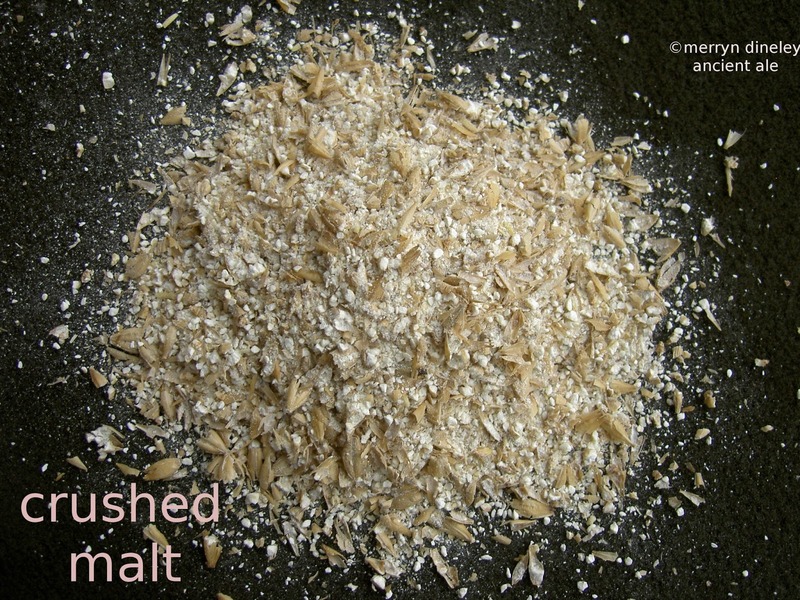 When crushed malt is mixed with water, then heated to around 67 degrees centigrade the enzymes within the grain reactivate and convert all grain starch into fermentable sugar. It usually takes about an hour for this enzymatic process to be completed. As the enzymes get to work, the aroma is sweet and delicious. You know whether or not it's working. The mash becomes sweeter. Knowledge, practice, experience and skill are all a part of the process. The photograph below was taken at the Eindhoven Open Air Museum where I did a mashing demonstration several years ago. I like this photo because you can see pale crushed malt in the two pots beside the hearth. The wonderful ceramic bowl on the fire was made by Flor Buchuk Gil. She was working as the potter at the Museum and, very generously, she gave me this pot to use on the day and to take home. I had some fun getting it on the aeroplane, but that's another story. In this bowl you can see the dark brown mash. Sugars have been made. I've written about it in an earlier post, the process is called saccharification. For this mashing in demonstration, I had mixed some of the crushed pale malt with water, then heated it by surrounding the bowl with charcoal. I wanted a gentle heat. It was a very good conversion. The next stage of the brewing process is to separate the sweet liquid from the grain. More sugars can be washed out of the mash by running hot water through it and collecting the run off. The sweet liquid is called wort and this is what can be fermented into alcohol. No need to add anything. All the sugars for fermentation have come from the grain.